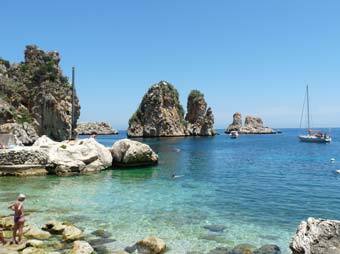 Scopello is not more than a hamlet above the coast in Sicily's north-western corner. But for several years now, this low-key destination has been in vogue not just with local people but with trend-setters including film directors and magazine photographers. The picturesque little spot may become a victim of its own success, but in the meantime it is still a remarkably scenic spot for a swim, a leisurely meal or an afternoon excursion. Scopello is a tiny village on the coast between the fishing and resort town of Castellammare del Golfo and the Zingaro nature reserve. This part of the Sicilian coastline, though dotted with villas and a few seaside developments, is nevertheless unusually well-conserved by the standards of this construction-happy island. There are attractive stretches of rocky coastline and green hillside nearby, and Sicilians from as far away as Palermo come to the Scopello area to enjoy the landscape and the sea bathing. Scopello itself is on a plateau some way above sea-level, though within walking distance of the shore below. The settlement consists of a historic baglio, the Baglio Isonzo, and a couple of attractive little lanes only a few yards long. 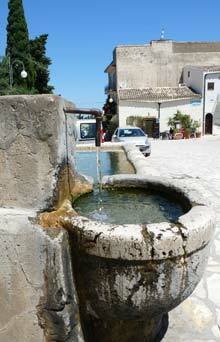 A baglio was the headquarters of an agricultural estate, rather like a masseria in Puglia. 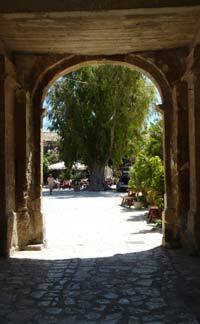 The Scopello baglio is now the heart of the village, its large courtyard offering some shade and respite from the hot sun. There are cafe tables, a ceramics/souvenir shop, and a choice of places to buy food, drink and ice creams. Outside the Baglio Isonzo is a picturesque water fountain with a trough, and around the corner are a couple of pretty little lanes, where you'll also find a hotel and a couple more restaurants. That's just about all there is to the village of Scopello; sightseeing here takes a matter of minutes. This is a place for a slow-paced holiday. Scopello village is pleasant enough, but visitors probably wouldn't come here if it weren't for what lies down on the sea below. A combination of manmade and natural features have created a gloriously scenic little cove which can be glimpsed from the village, and explored up close by swimmers and sun-bathers. Offshore there are dramatic faraglioni, rock towers in the sea. Two historic defensive towers stand poised on the rocks, combining with a third tower up by the village to unify the wider views. And in the small rocky bay there is a faded old tonnara, a tuna fishery, an important part of the history of this part of Sicily. The Tonnara di Scopello closed down in the 1980s, but for a couple of decades it remained as it was left, and visitors could wander among the old buildings and tuna fishing equipment (you can read some more about the Sicilian tuna fishing traditions on my Castellammare del Golfo page). The spot is hugely popular with local Sicilians, who don't mind sharing tiny patches of rock and concrete with many other sun-worshippers, and who revel in the clear waters for swimming. However, with lots of publicity, and the shooting of films here, including Ocean's Twelve and an episode of Inspector Montalbano, the owners of the Tonnara di Scopello evidently felt it was time to capitalise on the abandoned fishery. The crumbling buildings were renovated and closed off to the public, instead offering accommodation. The Tonnara's owners also privatised the whole cove (and views), to lot of local controversy. If you visit the cove and Tonnara now, be prepared to pay an admission charge. Before Scopello became a victim of its own success, it was possible to wander freely down the access lane to the sea, and to join other trippers on a narrow bit of slipway with concrete and rocks for sitting and sunbathing, some gravelly shore for paddling in, and clear waters for swimming. Out in the bay, boats bring other swimmers, mooring offshore to enjoy the scenery while swimming. There is a diving centre in Scopello (with an information office up in the village) if you want to become further acquainted with the rocky seashore and the little fish which swim about in the crystalline water. If you are not a swimmer, there's not much to occupy your time down at the Tonnara, but it is a magical spot and worth visiting for the scenery alone. Scopello can ideally be combined with a trip to the Zingaro nature reserve, or to the larger pebble beach at Guidaloca, nearby, where you'll find more facilities. If you fancy a leisurely lunch in the baglio courtyard or at a panoramic restaurant table high above the faraglioni, followed by a couple of hours swimming and sunbathing, Scopello could stretch into a full-day excursion. Scopello is best reached from Castellammare del Golfo, which does have its own public transport limitations. 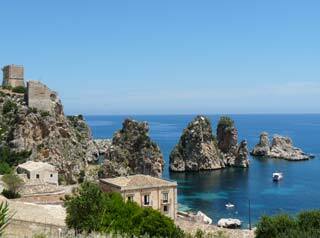 Frankly, this part of Sicily is most easily visited with a hire car. However, it's not impossible to reach Scopello by public transport. Two different companies run daily services from Castellammare to Scopello, and in the summer some services continue on an extra couple of miles to the Zingaro nature reserve. The buses only run a few times a day, so you will need to study timetables in advance (see links panel on the right). 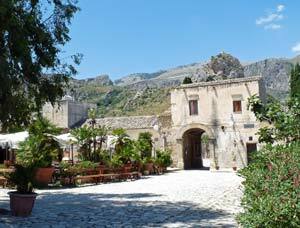 Alternatively, from Castellammare you can book a taxi or organised excursion for a reasonable price. Summer boat excursions from San Vito Lo Capo and Castellammare del Golfo generally stop at Scopello, though only for a view of the faraglioni and tonnara, and a swim from the boat. You can also hire boats in both seaside resorts, if you're feeling adventurous and want to make your own way to the cove by sea. There are several places to stay in and around Scopello. If you want to get away from it all (in the summer, you won't be alone in this aim), you can choose between hotels and more rustic accommodation. There are two or three restaurants, and a bus service a few times a day, but there's not much else locally, and staying at Scopello is most suited to those with their own transport. One of several possibilities in Scopello itself is the Hotel La Tavernetta, a small hotel, close to the Baglio Isonzo, with its own restaurant. Back along the coast towards Castellammare del Golfo, the Residence Guidaloca is close to the pleasant beach of the same name and has unusual accommodation in little 'igloo' bungalows.